I can't believe you called me aging. Darci: We'd be very compatible parents. Two aging narcissists. We'd only have the kid half the time. The other half we'd get to have lives. Rogelio: I can't believe you called me aging. 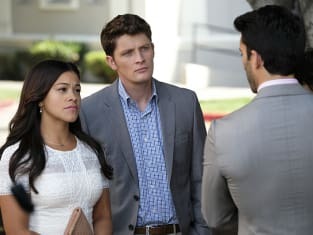 Jane the Virgin Season 3 Episode 7: "Chapter Fifty-One"
Rafael: I already told you if I disagreed, I'm gonna push back. Jane: Yeah, but I was hoping like once a year. Permalink: Yeah, but I was hoping like once a year. Xo: I know it must have been hard seeing me with someone else. Rogelio: Oh please! I have hundreds of women lining up to meet me. Literally. So while you're out meeting with your one measly lover, I will be meeting with a matchmaker.